Swiping, checking your phone, and playing games in bed seem like a good idea, that is until you hear about the middle-aged man who's now got the neck of a 70-year-old. Taiwanese media, and Chinese media, report that a 35-year-old man in Taichung, Taiwan is now suffering from neck problems after spending about 3 hours a night playing on his phone before going to bed. Doctors say the man's problem comes from long periods of staring at his phone with his head looking down, and from long periods of time with his head on a pillow looking at his phone. Both positions are supposedly bad because they have the head in an unnatural pose. About two months ago, the 35-year-old engineer started to complain about loss of feeling in his arms and neck pain. After visiting the doctors, he was told that he has bone spurs on his neck bone. Not only that, but the vertebrae have also deteriorated. Doctors say that the man now has the neck bones of a 70-year-old. 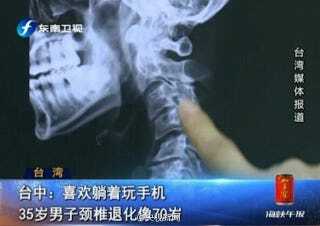 Doctors interviewed by Taiwanese media all say this kind of injury is common for people who hold their heads in unusual positions for long periods of time. Supposedly neck problems have grown amongst the younger population in Taiwan over the last five years. One doctor says that there are exercises that one can do to help alleviate stress on the neck. One of the exercises looks like something Quagmire does—guess he's got a very strong neck.